Merton's well-founded reputation as a centre of academic excellence does not mean the College lacks for opportunities to participate in sports of all types - from cricket to canoe polo. We can boast our fair share of sporting successes too, both past and present. Whether you are keen to achieve a Blue, play for fun, or fitness, there is plenty to get involved with. The College is pleased to be able to contribute towards costs for those who play their sport at the University or higher levels. Undergraduate and graduate students currently take part in a wide range of sports including—but not limited to—football, rugby, cricket, pool (the College has its own full-size table, free to use), croquet and squash. The Merton College Boat Club puts out several men's and women's boats for Oxford’s major rowing events—Summer Eights, Torpids, and Christ Church Regatta—and summer 2014 saw the revivial of the SCR VIII, who gave a strong account of themselves amongst the younger crews. For a number of sports—football and rugby in particular—Merton teams up with Mansfield College to field joint teams. Annual events include a JCR vs SCR Cricket Match and participation in the Oxford Town & Gown 10K run in May, the College team regularly including students, staff, Fellows and alumni; our highest placed runner in 2017 was Henry Hodson (2013) with a time of 39m 20s. There is a College Sub-Committee dedicated to Sports and Grounds, convened by the Senior Treasurer of the Amalgamated Clubs, Dr Jonathan Prag. He works closely with the JCR Sports Rep, officially known as the Junior Treasurer of the Amalgamated Clubs. Our current crop of sporting stars talk about life at Merton - how they balance training sessions and essay deadlines, what got them involved in their chosen sport, and what motivates them to strive for success on the field of play as well as in the examination room. Merton has its own extensive sports ground only a ten-minute walk away from the main site with pitches, a pavilion & changing rooms, tennis courts - both grass and hard and squash courts. 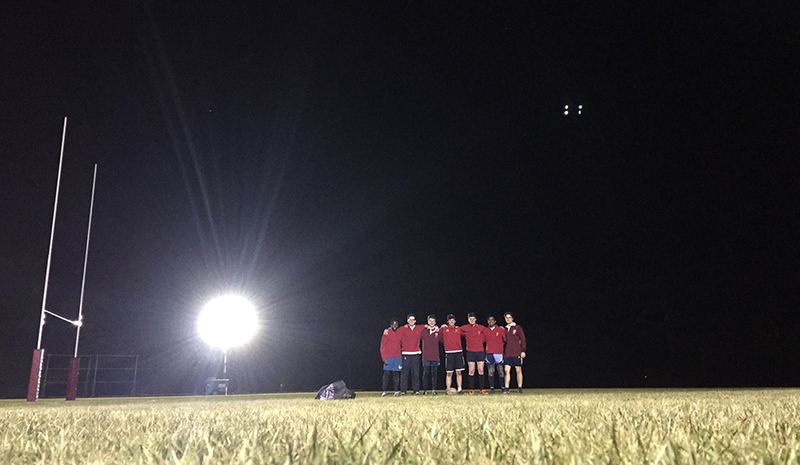 We have a set of mobile floodlights, which means that sports aren't restricted to daylight hours so our teams can train throughout the year. Merton College Boathouse is located a short distance across Christ Church Meadow, punts and kayaks are also freely available to use on the river. There is a Real Tennis Court on Merton Street itself—the second oldest court in England after Hampton Court Palace—which is used by Oxford University Tennis Club. On the main site there is a well-equipped gym with a variety of weight-training equipment, rowing and running machines. Students also have access to a Games Room, with a pool table, table football, darts and dartboard- all free to use. In addition yoga and circuit training classes are provided, led by qualified instructors. The sports facilities are ably looked after by a College Waterman and Groundsman. Merton is able to contribute to the costs of membership, facility fees and travel for those who play their sport at the University or higher levels. Grants for sport to individual student members of the College are made for any activity recognised as a sport by Oxford University Sport Federation or by the International Olympic Committee (though not for sports equipment, tuition or coaching). They are intended to enable participation in non-College sporting activities, including membership and facility fees and travel costs. Previous recipients have included champion rower Kathryn Twyman. Funding is also available from the College Sports Fund to students competing in University sports and who participate in a varsity match at First or Second team level (the award of a Blue is not necessary). Funding is available for all College-representative sporting activity through the Amalgamated Clubs (so-called because it represents the joint sporting activities of Merton and Mansfield Colleges). The main site for University sport is located less than a 10-minute walk away on Iffley Road. Here you can access the Rosenblatt 25m Indoor Swimming Pool, athletics track, rowing tank and many other courts, pitches and facilities. Oxford University Sport website contains detailed information on student sports clubs, membership options and a virtual tour of the facilities. You can also follow them on Twitter and Facebook.